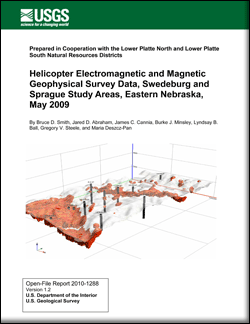 This report is a release of digital data from a helicopter electromagnetic and magnetic survey conducted by Fugro Airborne Surveys in areas of eastern Nebraska as part of a joint hydrologic study by the Lower Platte North and Lower Platte South Natural Resources Districts, and the U.S. Geological Survey. The survey flight lines covered 1,418.6 line km (882 line mile). The survey was flown from April 22 to May 2, 2009. The objective of the contracted survey was to improve the understanding of the relation between surface water and groundwater systems critical to developing groundwater models used in management programs for water resources. The electromagnetic equipment consisted of six different coil-pair orientations that measured resistivity at separate frequencies from about 400 hertz to about 140,000 hertz. The electromagnetic data were converted to georeferenced electrical resistivity grids and maps for each frequency that represent different approximate depths of investigation for each survey area. The electrical resistivity data were input into a numerical inversion to estimate resistivity variations with depth. In addition to the electromagnetic data, total field magnetic data and digital elevation data were collected. Data released in this report consist of flight line data, digital grids, digital databases of the inverted electrical resistivity with depth, and digital maps of the apparent resistivity and total magnetic field. The range of subsurface investigation is comparable to the depth of shallow aquifers. The survey areas, Swedeburg and Sprague, were chosen based on results from test flights in 2007 in eastern Nebraska and needs of local water managers. The geophysical and hydrologic information from U.S. Geological Survey studies are being used by resource managers to develop groundwater resource plans for the area. Smith, B.D., Abraham, J.D., Cannia, J.C., Minsley, B.J., Ball, L.B., Steele, G.V., and Deszcz-Pan, Maria, 2011, Helicopter electromagnetic and magnetic geophysical survey data, Swedeburg and Sprague study areas, eastern Nebraska, May 2009: U.S. Geological Survey Open-File Report 2010–1288, 37 p.